That’s a great drawing! It made me think of a plotline to go with it. A woman who has been treated very unhappily in life falls in love with the fairy who visited her in childhood. (Parents thought it was an imaginary friend.) 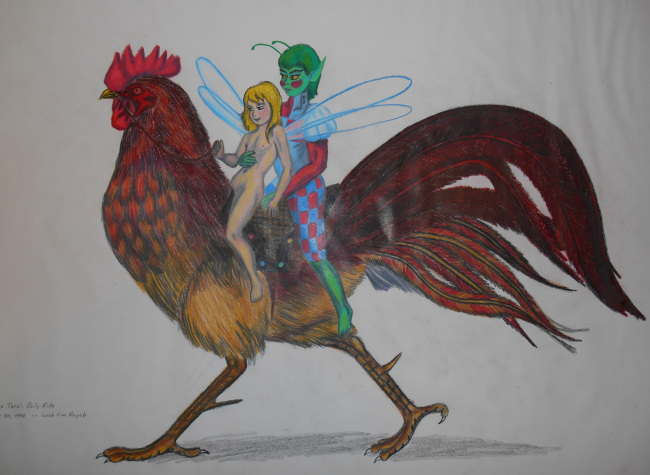 Once she has reached physical adulthood, Mr. Fairy appears and makes a one-time offer to change her into a fairy so they can live together forever. This only happens with adults who have retained their core innocence, causing them to be misfits in human world. It is also the only way a new fairy can be made. The only way a child would ever become a pixie might be an older child be at the point of death. The fairy doing it would have to love the child very very much. It is still frowned upon. Imagine being trapped in a child’s body forever, never to experience adulthood and surrounded entirely by adults! It is thought better to allow the child to reincarnate as its innocence would assure reincarnation as something really good. Once she’s a fairy, she will be invisible to most people. Only the most innocent of children can see her. She’ll sprout wings. She’ll gain powers in the fairy world but her ability to affect the human world will be limited. She is essentially immortal and unchanging, That – and because a child cannot fully consent to such a thing – is why her fairy friend had to wait. Appearing before an adult human takes an enormous amount of power and he would not be able to do so again within a human lifetime. Even though immortal, a fairy can still die. The body has tremendous healing power but it can still be damaged beyond recovery. A substantial amount of unspoiled nature in the human world is required to provide fairy energy, otherwise one can fall into eternal sleep. Human world threats can hurt her when she enters the human realm. Fairy world has a few threats too. Easily dealt with once you are aware of them but to a newbie they can kill. “Pixie dust” is fairy poo. Human world catnip is a favorite intoxicant. Animals can see fairies because they are inherently innocent but unless a fairy exercises command over them, fairies are ignored. Fairies can’t get pregnant nor can they catch a disease. Human world temperatures range from -40F below to +120F are easily tolerated (Magic!). Inside fairy world the climate is perfect. Fairies only wear clothing for decoration and never anywhere other than human world. When you shrink to fairy size, your clothes don’t shrink with you and there may be a period of getting used to it. Per J. M. Barrie, females are pink, males are blue. Those who cannot make up their mind are purple. Orgies are known to happen. Tink says this is just a rumor. This is a great concept for a story. What would be the conflict? I am greatly intrigued. When I drew this years ago, she was the Princess of the Willow Kingdom and daughter of the 341st Erlking. The green guy is the Grassman, her assigned body guard who secretly loves her, a forbidden love. The steed is Red Rory, her favorite steed, a rooster stolen from the Stuart Efram farm in Wright County Iowa. But I would definitely read your story. I’m thinking someone who ought not to have been turned fairy goes bad. Maybe someone who was turned too young just before he died, and is still full of pain and anger from child abuse? Then he easily falls under some malevolent dark magic wielder’s influence. Maybe also a master of technology who saw fairies himself as a child and hates them for NOT taking him? I’m thinking a mentally disabled elderly adult could be the hero on the human side. One who could still see fairies because still innocent. Contrast with genius tech wizard villain. Make him/her the janitor for the bad guy, ridiculed and made fun of but they can’t take away the smile. Mr. Bad never saw it coming. Heroine is techno-savvy, also something Mr. Bad never thought of. Fairies, as far as he knows, are technophobic. And now I’m thinking about how the heroine might have known the fairy boy who went bad when she was very young as well.